Another food blogger referred to pastry cream as “the most delicious pudding you’ll ever eat.” This is quite true, I think. 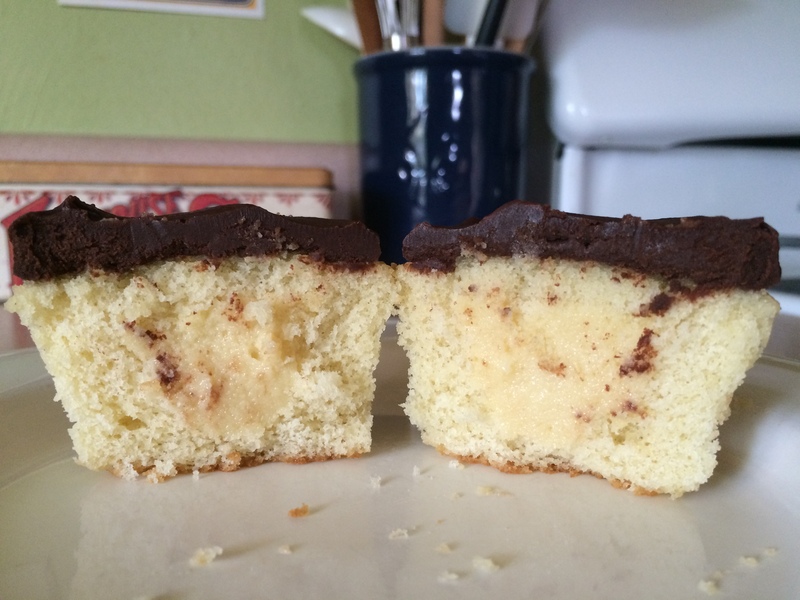 There are many recipes for pastry cream, and I used this one for the Boston cream cupcakes featured in this photo. It’s very important to pay close attention while making pastry cream, because you can go from done to overdone in a matter of seconds. I find it helpful to set out all of my ingredients beforehand to avoid any delays; you’ll be very grateful that your vanilla extract is already measured out and waiting in a small prep bowl when it comes time to stir it into your pastry cream mixture, believe me. In a medium saucepan, heat heavy cream over medium heat until simmering, stirring occasionally. In a large, 4-cup glass measuring cup, mix egg yolks, sugar, and salt until well-combined. Add cornstarch and mix very well, until mixture is pale yellow and thick, about 15 seconds. When the cream reaches a full simmer, slowly whisk it into the egg mixture, then return the mixture to the pan and cook over medium heat, whisking constantly, for 1-2 minutes until thick and glossy. Remove from heat and whisk in butter and vanilla until butter is completely melted; your mixture may look like it’s starting to separate a bit, but it will be fine. Transfer to a bowl and press plastic wrap on the top, covering completely. Refrigerate until set; I let mine sit overnight.